The presence of the media inevitably changes the nature of protest–Kashmir and the North-East are invisible because they’re not on TV, as many pointed out yesterday, but Delhi’s protests will always attract full coverage. That also changes the nature of a spontaneous protest: everyone from casual gawkers to politicians really wants to see themselves on the nine o’clock news. Though there were many families, students and mother-daughter pairs present, the crowd this morning was significantly more organised, from the JNUSU and AISA to the BJP’s student wing. Baba Ramdev was supposed to be on his way, because of course *that’s* what yesterday’s young protestors had secretly wanted all along–Baba Ramdev! Riding into Delhi on top of a bus! The solution to the problem of sexual violence against women in India that none of us had been bright enough to dream up! On a side note, by making it difficult for students and young men and women to reach India Gate after the Metros were shut down and roads cordoned off, the Delhi government may actually have allowed the protest to be taken over by political parties of all stamps. 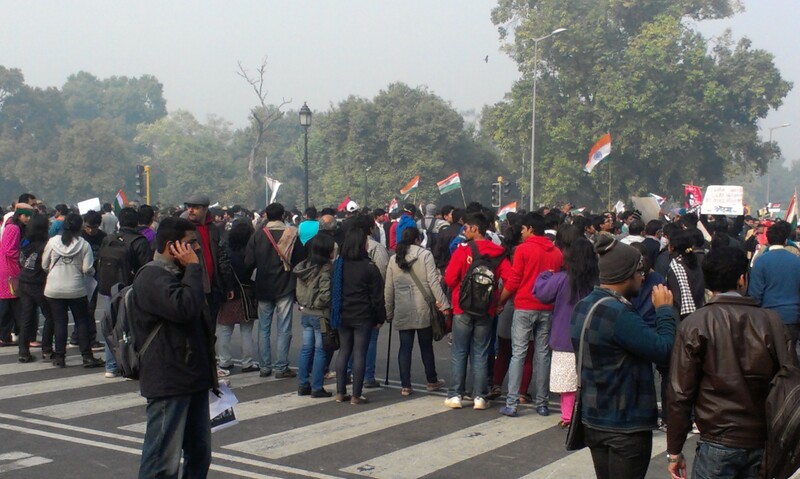 Students, towards the back of the protest at India Gate. Most of them walked down from distant Metro stations. Despite Section 144 being in place, we weren’t stopped as we walked down with about 700 activists and supporters from Nizamuddin towards India Gate this morning. 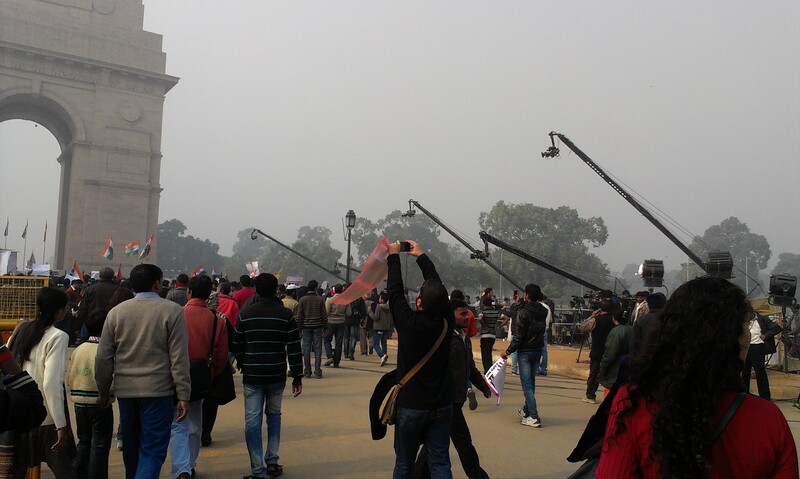 Police allowed protestors to knock over barricades at India Gate and move towards the centre, only firing teargas and using the water cannons a little later, when some protestors started throwing traffic cones and slippers around. The water cannons and the teargas hit a lot of the more peaceful protestors, unfortunately. But the impression that the police had been asked not to over-react was very strong. 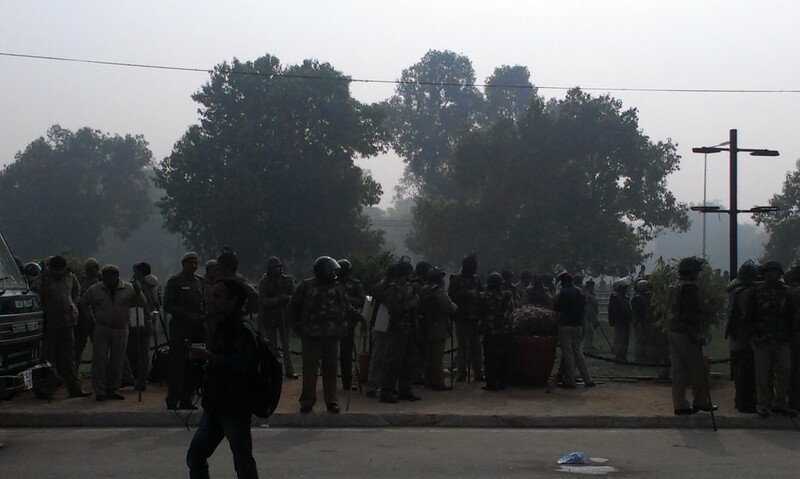 The police lines at India Gate, though my sense was that they’d been instructed to go relatively easy on the protestors. Perhaps because it was a smaller crowd today–about 2,000 when we left–the teargas shells found their targets much more easily than yesterday. 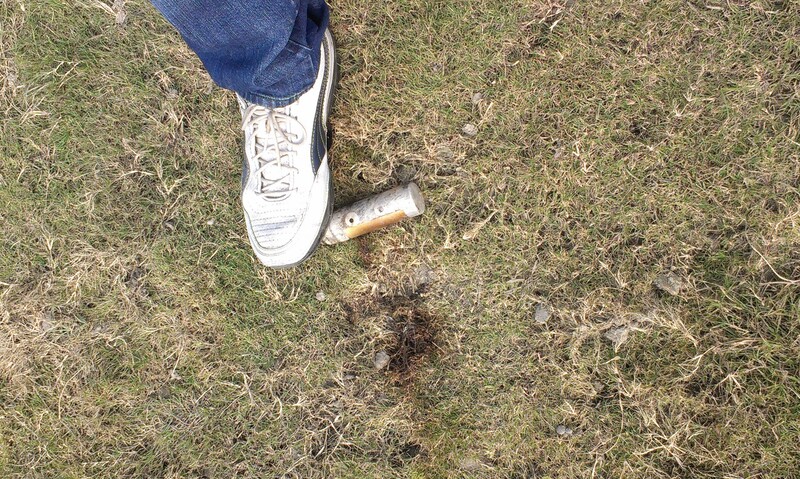 Teargas shell, from the first teargas firing. Short of riot situations, I’d never seen the roads around India Gate so eerily silent and empty. At the India Gate-Akbar Road crossing. Students were walking down from various Metro stations, undeterred by the fact that Central Secretariat and other stations were closed, many cheerfully talking about how they’d get there in time for the post-lunch “protest session”. Update: By evening, the protests had turned violent, sadly, with some protestors blaming political parties and “outside elements” for introducing aggression into what had been, on Saturday, a peaceful protest. 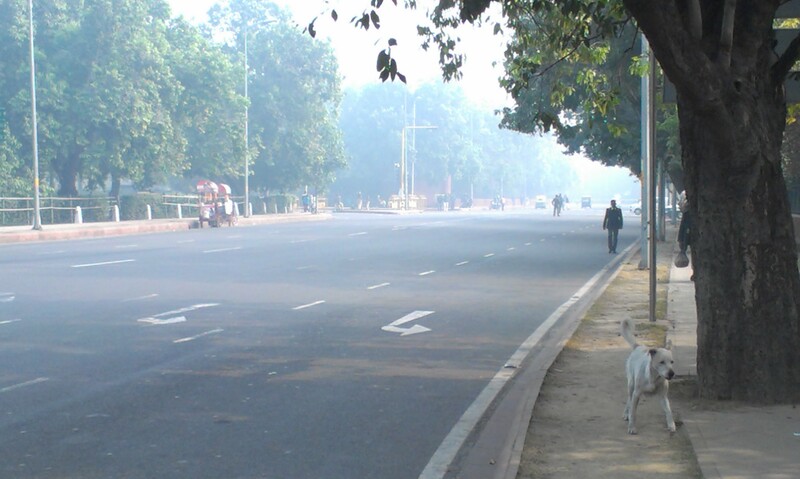 Sanitising the area: empty roads around India Gate.